Time has absolutely whizzed by and here we are at the 5th Yule Tarot Blog Hop! Our wrangler, Arwen, has invited us to “The Office Party” and asked us to give you, our readers, a gift. 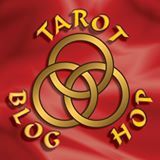 So here we are again, another Yule, another Yule Tarot Blog Hop. This time the theme has been given as “TURNING DARKNESS INTO LIGHT” with instruction to describe how we bring light to those around us and how we celebrate light with Yuletide traditions. You can follow the links below to navigate around the Blog Hop and read what everyone else has shared. Welcome to the Yule Tarot Blog Hop. The theme du jour is “Christmas Present” – a topic that I have no doubt has yielded diverse and interesting posts from our wonderful collection of bloggers. You can find links at the bottom of the page back to the lovely (and prolific) Chloe’s Lenormand Blog forward to Joanne’s Tarot blog or back to Alison’s master list of all the hoppers. Life is short and at this time of year the days make it seem even shorter. As we hurtle towards the outbreak of festivities with joy, dread, mild panic or all three, perhaps it is time to take a moment to reflect. Alternatively, if you have no time, no time, no time (oops, mild panic creeping out there), and the world has not, in fact, ended as predicted today, you can always wait until the main event is over and you are quietly thanking providence for surviving the food, family and festivities in a warm, overfed and alcoholic glow.